Recently built two-storey duplex house. Situated in the gorgeous locality of Cinquale. 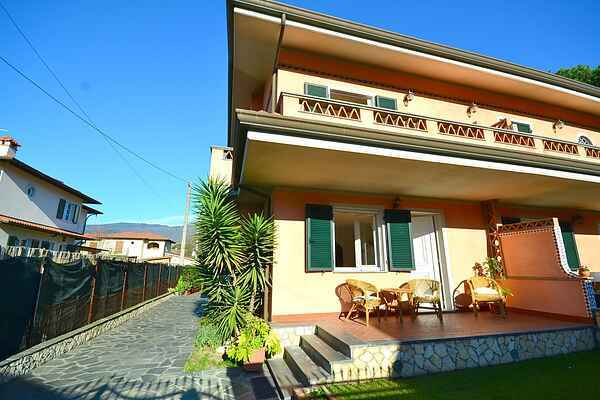 This spacious villa, furnished with style and taste, is well-finished to the smallest detail. And, for some, the most important: there are mosquito nets everywhere! The house is just 1,3km from the sea. You will find stores 800 meters away, where you can do your shopping. Besides stores and bars, Cinquale also has thermal baths: the Versilia hot springs. This spa location is not only famous for the healing properties of its waters, but also for its marble mountains, which seem, in the distance, as though they are covered with snow all year round. Certain marble caves are open to the public - a good idea for passing a day. If you are curious about learning how marble is used, taking a trip to Pisa (40 km) or Florence (100 km) is a must. Here, you can admire the marble used on many church facades and various other buildings. There is WIFI available, but please specify in advance when booking. The WIFI cubes have a max. of 100 MB per day. Sufficient for whatsapp, internet and email but not enough to download, watch movies, youtube etc. Cinquale is a splendid seaside resort with several beach clubs (private beaches) and trattorias, serving wonderful local dishes. You can also go shopping at the supermarket, which is 350 meters away from the holiday home. More stores can be found in Marina di Massa and Massa (at 4 km). You will need a car in order to visit the Versilia inland, Pisa (at 40 km) and Florence (at 100 km). In Pisa, you will come across the famous Leaning Tower and if you walk over the river, you will find yourself in the real center of Pisa, surrounded by local restaurants.